Broadcast & distribute best-in-quality video content to any screen at any time. Pick your choices! Customize your online video on demand platform with awesome integrations that performs beyond your expectations. Experience what we mean by great headway features. Ensure the particulars of every individual content stays intact through an integrated, dynamic system. Amplify your productivity with Vplayed’s versatile content management system. Vplayed employs modernized rock-hard video distribution strategies for upgraded performance. Be assured of delivering rich quality and delay-free content experience. Harness the power of video on demand platform by operating on the cloud. Transcode and secure hosting of your video content with Vplayed’s flabbergasting pivotal hosting features. Vplayed uses custom-built HLS player to retain the authenticity of each white label video on demand solution. Make your video content compatible and instantly responsive on all platforms. 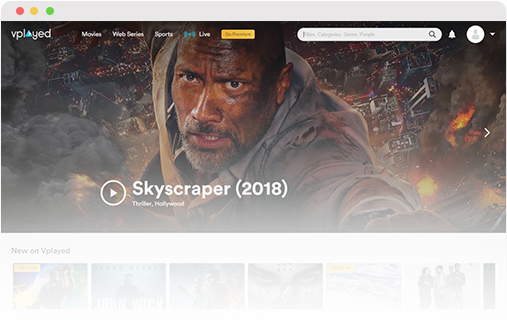 Upgrade your vod platform with PWA technology to deliver an app-like experience to users on both web and native apps. Perceive the advantage of offline functioning, push notification & minimal app size to drive user engagement. Shielded with encryption, DRM and access control to safeguard video platform against unauthorized access. Data Rights Management serves as a security support safeguarding your video content to stop from being exploited by unauthorized with the help of our license policies. Access control bears an explicit user authentication system, clarified one-stop sign-in API integration & IP restriction to stimulate alerts when unsanctioned access occurs. Vplayed trailblazes in encryption systems. The Partial and Open key exchange mechanism using HLS encryption with AES and RTMP Protocol stays unrivaled in the market. Make your video on demand platform notable with in-depth analysis and automated marketing workflow. Streaming can be interactive and engaging with Vplayed. Let your users build communities through commenting, sharing and favoriting on videos. Behavioral reports and user analytics provides insightful affirmative real-time analytics, individual video performance, and viewer diagnostic reports. Wash out human errors and technical glitches from your client relationship management with effective streamlining of marketing tasks in high productivity. Tap the most out of subscription swing(SVOD) with custom monthly or yearly subscriptions and free trial periods. Gain recurring viewer base through well-planned subscription models. Garner preroll midroll and end-roll range of ad designs strategically placed to woo viewers’ attention. Ads on VOD platform allows owners to cash on banners, navigation bars, and square buttons. Vplayed’s coupons and promotional formula let your viewers gain discount by coupon codes and responding to your branding strategies. Venture in our prudent promotional coupons and discounts to pitch in high returns.